Who loves a simple knit dress? This girl! I knew when I saw this dress in the Burda magazine, I would have to make it. It’s simple and a knit. The pattern itself is a simple t-shirt dress with a little extra. The side seams are cut to be crooked, but then you are supposed to twist it when you wear it to create a lightly gathered look. Great idea. More on that in a minute. Here’s my version. You probably can’t see the light gathering because of the fabric. Love this fabric, by the way. It’s from the Swap Meet in San Diego. The fit is nice. I made my standard 34 with no alterations. I love that the back and front are similar with the slight v-necks. The inside has a lined bodice that also serves as the facing. I went ahead and used it because I’ve found that a facing works best when you want a crisp v-neck like this. Yes, there are other ways to do it. See the “side” seam?? Let’s talk about this fabric for a second. I love it. You may see it again as a dolman top. I think I have enough scraps to get a small top out of it. Now let’s talk about the light gathering and the twists in this dress. Yes, it’s a great idea to make the dress fit with curved side seams that you adjust to make them straight. However, what really happens is those little buggers slip back around your body so that the “side” seam comes around to the front and back of the body. You can’t see it in my version because of the print, but it would drive me crazy in a solid version because you would see that the “side” seam isn’t really at the side. Also, the sleeves have the same little twist, but I think it looks more like an accident than a design feature. Again, super glad this is in a crazy print. Here I tried to outline the gathering so you can see it better. As I would walk, the dress would slip around me like a hula-hoop and I was adjusting it every 5 minutes. It’s not that annoying and I will wear the dress, just be forewarned. I made the dress a little tighter at the waist and top of the hips and that stopped a lot of the hula-hooping, but still . . .
Next up, commercial fishing soon!!!! Raincoats and maybe rain pants for a herd of kids!!! June 1st? Best day ever. First, I had a great half-marathon and got a personal best of 1:45. I realize that's not super fast, but it's fast for me. Here's me at the end. It's super hot for an Alaskan girl. 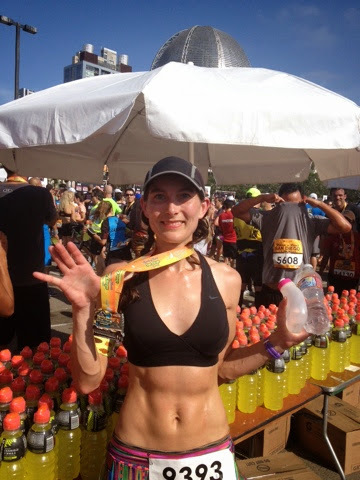 I wore my Jalie shorts and they were fantastic for 13.1 miles. I put GU in my pockets and there was no jiggling at all. 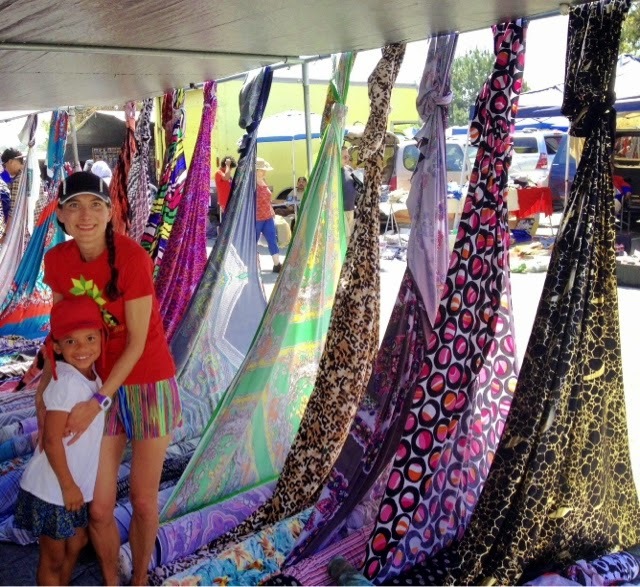 Then, from there, we went to the Swap Meet to buy tons of fun fabric. 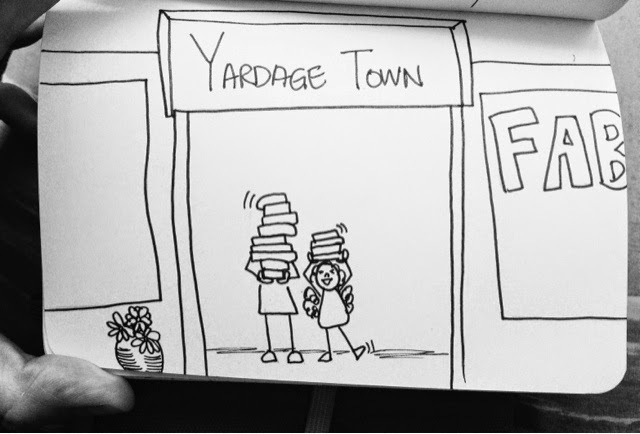 Then we went to Yardage Town to buy a few other things. We didn't take a picture so I drew a little one. We bought swimwear fabric mostly. We finished off the day with margaritas by the pool and beach. Jalie 3352 #3 - My Favorite One!!!! This is my third and favorite Jalie Dolman Top. I was inspired by Jalie's own version where they used this same print but in a different colorway. I used (like totally copied) the same placement of fabric and everything. I love, love, love it and I've been wearing it often in the sunny land of California. The placement of the motif looks crooked, but it's not. It's the wind. Pretend that the first picture is here. The one of the front. I love how the back is longer than the front (pretend you are looking at the second picture of my bum with the Jalie top covering it). And I seriously love the colors of this knit. (pretend you are looking at the close-up of the knit - work with me here). I did really well in my half-marathon and I'll tell you more about that later. It was like the best day of my life.